Booking is currently available for live event painting! An extra special reminder of your extra special occasion. 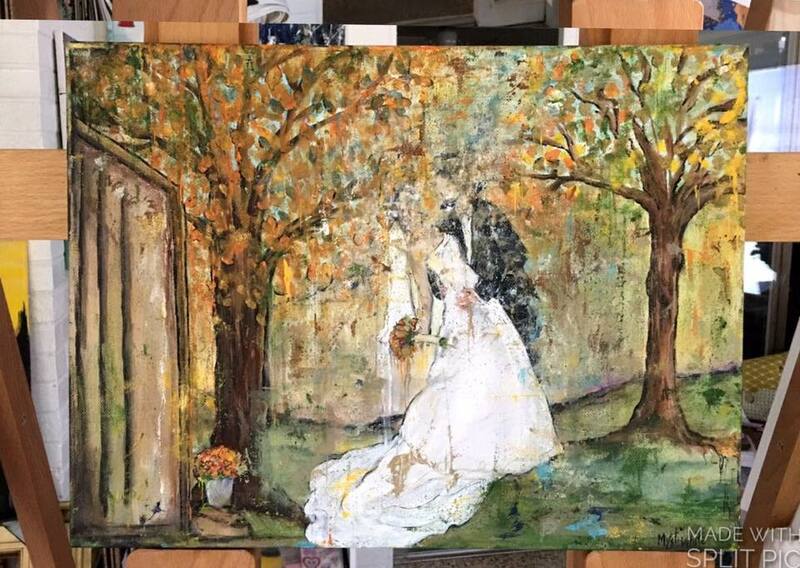 I would love to paint a unique, one of a kind painting that captures the feel of your event while the event is taking place. In most cases the painting will be complete by the end of event, however I will usually take the canvas back to my studio for a few finishing touches before delivering or shipping the finished painting to you. You can request a close up or full scene, and a variety of canvas size options are available. 1. What type paint do you use? I use a variety of water based, non toxic, acrylic paints. Acrylic paints dry quickly which allows me to work at a faster pace and transport the canvas after the event. 2. How much time do you need to set up? Ideally, I like to arrive 2-3 hours in advance, however if absolutely necessary I can set up in 30 minutes and be ready to start painting. 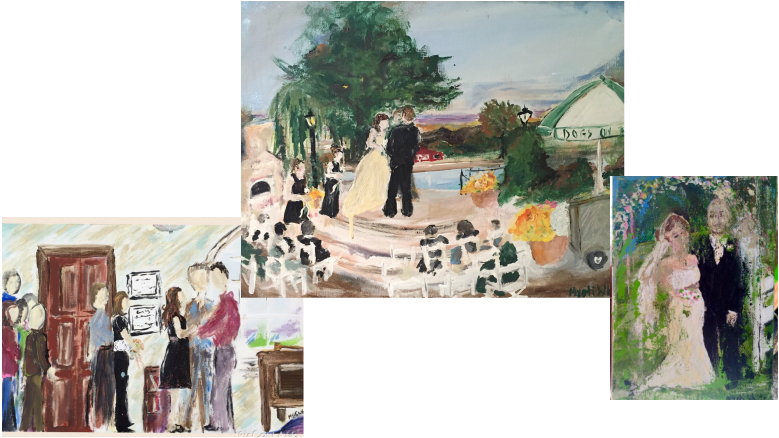 I would prefer to arrive early and paint most of the background before guests arrive. In that case the guest will already be able to see what is happening when they first get there. I will be able to focus more on adding people during the party. Anything not completed at the event will be finished in my studio. 3. What sort of set up do you require to be available? The setup on your part is minimal and usually does not require assistance from event staff. I will supply almost everything I need, including a large painter's drop cloth to spread out and work on. I will need a small painting area set aside in advance of my arrival, approximately 4' X 6' is usually sufficient, inside or outside. Unless it is an outdoor, daytime event, I will need a power outlet for my lamp. I need access to water, or at least a place to dump paint water if needed. I can bring jugs of water with me to use for cleaning brushes if necessary. I will need to set up in a spot that gives me a good view of whatever scene I am painting. 4. Will the painting be framed? I will painted on a stretched canvas that will be ready to hang as is and unframed. Canvas can be framed if you prefer. Most hobby and framing shops can provide this for you. 5. Where are you located and will you travel? I am based in the Middle Tennessee, Nashville area. I am happy to travel anywhere. In this case clients cover travel costs such as airfare and hotels. Out-of-town events that are under 2 hours in driving distance from my home base do not usually require overnight stay, but do involve a small travel fee ranging from $50-$100 or current IRS mileage allowance. Travel fees apply on any event over 30 miles one way. 6. Can I request a painting after an event using only pictures? Although in a perfect world I would be at your event live, Yes! I would be happy to paint after the fact in my studio using your photos and videos. We will talk and you can give me a feel for the occasion and any special requests you might have before I begin the painting. As with the live painting, you can choose the size painting you would like in order to best fit your budget. Price of the live painting varies from $350 - $3000 depending on the size canvas requested, and when necessary travel expenses are additional.